Set a few years on from the events of Civil War, and shortly before the events of Infinity War, Scott Lang (Paul Rudd), is serving the last few days of his house arrest for his participation in the airport battle in Germany, which also turned Hank and Hope (Evangeline Lilly) into accessories, in breach of the Zarkovia Accords. Consequently they're wanted by the FBI. 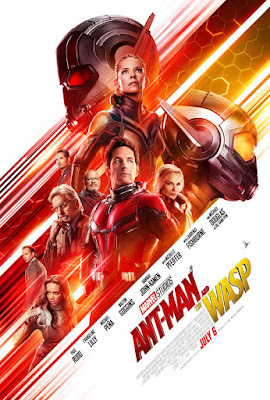 I've heard people say this movie isn't as funny as the first movie like that's a bad thing, or that the Ant Man movies in general are meant to be viewed as comedies, rather than superhero films, just because Paul Rudd is the title character. I would agree it's not as funny but some of that is due to already being familiar with Hank's technology that can make anything big or small. It's less funny to see a giant Pez candy dispenser being used during a chase scene to bring down the bad guys because it's no longer surprising. If anything it looks kinda cool rather than funny. (This scene was in the trailers too... so you may have already seen it prior to the film). Ant Man and the Wasp isn't any less of a film for being less funny. If anything it's an improvement on the first film by not following the same formula of having one clear villain who must be stopped. Where the first movie was a heist film, this one could be described as a chase movie, with several people all going after the same thing. Even better we get to see Hope as the Wasp. Not beginner Wasp either. She's clearly gotten used to the suit, which may even have gone through a few upgrades since we saw it last at the end of the previous film. As the Wasp she is very confident in her combat abilities. Also enjoyable is how this film plays even more with the making things bigger or smaller aspect of Ant Man movies. The things you see are completely bonkers but at no time do you ever question the technology or the physics as you're watching. You probably will after the fact but during the movie it's just so much fun and, for me at least, I never get taken out of the film. For example Hank spends some of the movie giving complex instructions, in English, to giant ants, like ants can actually understand English and how to build electronics, and I didn't care, because I just assume he can and they do. If the movie has any missteps for me it's that one of the antagonists could have probably just tracked Hank down and asked him for help. There's every chance he would have just because the science and the challenge would have fascinated him. Not to mention this person's problem was indirectly caused by Hank as well. Once he realized that he would certainly have been on board with finding a solution. That said, this person actually made for a pretty cool antagonist who I'd be down to see appear in future films. It's fun, it has as many laughs as any of the MCU films, the action is unlike any of the other of the Marvel Universe, and the mid credit scene is well worth sticking around for if you've been watching all the films in the series.